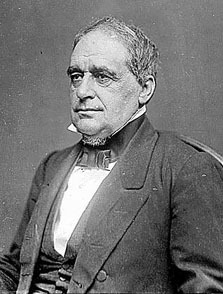 Hannibal Hamlin, Vice President of the United States from 1861-65, was born at Paris, Maine, on the 27th of August 1809. After studying in Hebron Academy, he conducted his father's farm for a time, became schoolmaster, and later managed a weekly newspaper at Paris. He then studied law, was admitted to the bar in 1833, and rapidly acquired a reputation as an able lawyer and a good public speaker. Entering politics as an anti-slavery Democrat, he was a member of the state House of Representatives in 1836-40, serving as its presiding officer during the last four years. He was a representative in Congress from 1843 to 1847, and was a member of the United States Senate from 1848 to 1856. From the very beginning of his service in Congress he was prominent as an opponent of the extension of slavery; he was a conspicuous supporter of the Wilmot Proviso, spoke against the Compromise Measures of 1850, and in 1856, chiefly because of the passage in 1854 of the Kansas-Nebraska Bill, which repealed the Missouri Compromise, and his party's endorsement of that repeal at the Cincinnati Convention two years later, he withdrew from the Democrats and joined the newly organized Republican party. The Republicans of Maine nominated him for governor in the same year, and having carried the election by a large majority he was inaugurated in this office on the 8th of January 1857. In the latter part of February, however, he resigned the governorship, and was again a member of the Senate from 1857 to January 1861. From 1861 to 1865, during the Civil War, he was Vice President of the United States. While in this office he was one of the chief advisers of President Abraham Lincoln, and urged both the Emancipation Proclamation and the arming of the negroes. After the war he again served in the Senate (1869-81), was minister to Spain (1881-83), and then retired from public life. He died at Bangor, Maine, on the 4th of July 1891.